The Pharisee and the Publican, baroque fresco in Ottobeuren Basilica. The parable of the Pharisee and the Publican (or the Pharisee and the Tax Collector) is a parable of Jesus that appears in the Gospel of Luke. In Luke 18:9-14, a Pharisee, obsessed by his own virtue, is contrasted with a tax collector who humbly asks God for mercy. This parable demonstrates the need to pray humbly. It immediately follows the Parable of the Unjust Judge, which is also about prayer. In the Eastern Orthodox Church, the Sunday of the Publican and the Pharisee commemorates the parable and begins the three-week pre-Lenten Season. He spoke also this parable to certain people who were convinced of their own righteousness, and who despised all others. "Two men went up into the temple to pray; one was a Pharisee, and the other was a tax collector. The Pharisee stood and prayed to himself like this: 'God, I thank you, that I am not like the rest of men, extortioners, unrighteous, adulterers, or even like this tax collector. I fast twice a week. I give tithes of all that I get.' But the tax collector, standing far away, wouldn't even lift up his eyes to heaven, but beat his breast, saying, 'God, be merciful to me, a sinner!' I tell you, this man went down to his house justified rather than the other; for everyone who exalts himself will be humbled, but he who humbles himself will be exalted." In the New Testament's telling, Pharisees often display a punctilious adherence to Jewish Law. The Pharisee depicted in this parable went beyond his fellows, fasting more often than was required, and giving a tithe on all he receives, even in cases where the religious rules did not require it. Confident in his religiosity, the Pharisee asks God for nothing, and thus receives nothing. Detail of stained glass window of the parable, Janskerk (Gouda). On the other hand, publicans were despised Jews who collaborated with the Roman Empire. Because they were best known for collecting tolls or taxes (see tax farming), they are commonly described as tax collectors. The parable, however, does not condemn the publican's occupation (cf Luke 3:12-13), but describes the publican as one who "recognizes his state of unworthiness before God and confesses his need for reconciliation". Coming to God in humility, the publican receives the mercy and reconciliation he asks for. Let us flee from the pride of the Pharisee! And learn humility from the Publican's tears! The English writer and preacher John Bunyan wrote a book on the parable in 1685. The parable has been depicted in a variety of religious art, being especially significant in Eastern Orthodox iconography. There are works on the parable by artists such as James Tissot, John Everett Millais, Hans Holbein the Younger, and Gustave Doré. 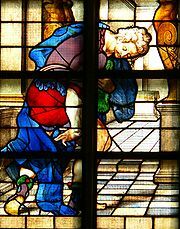 Wikimedia Commons has media related to Pharisee and the Publican. ^ a b c d Joel B. Green, The Gospel of Luke, Eerdmans, 1997, ISBN 0-8028-2315-7, pp. 643-649. ^ Georges Augustin Barrois, Scripture Readings in Orthodox Worship, St Vladimir's Seminary Press, 1977, ISBN 0-913836-41-9, p. 21. ^ Triodion prayers at ocf.org. ^ The Pharisee and Publican by John Bunyan at Project Gutenberg. This page was last edited on 23 September 2018, at 15:15 (UTC).